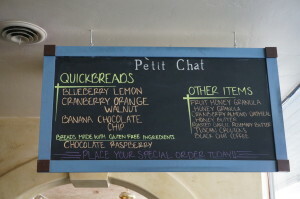 A Bit of France in Spokane | Get Lost. Often. 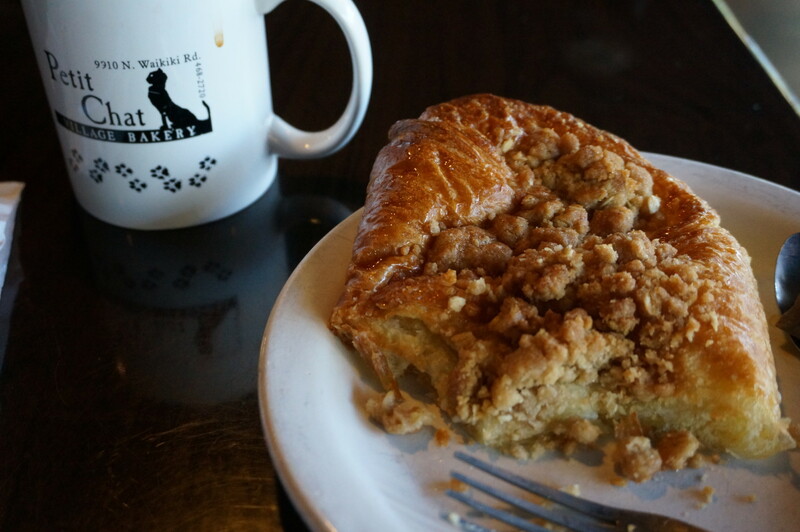 With several writing assignments due, I decided that I needed a change of scenery to get my creative juices flowing, so I chose to go to Petit Chat this morning. 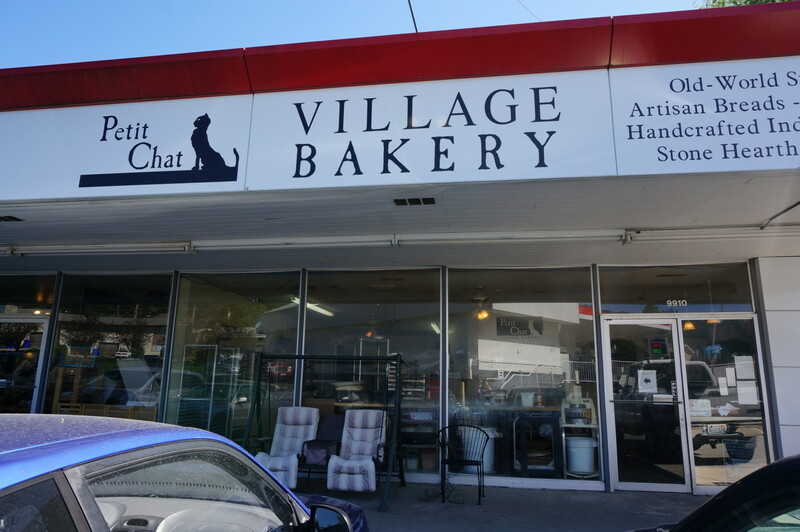 Petit Chat means kitten in French and you can tell that the owners of the Petit Chat Village Bakery love animals from the cat statue decor to the homemade dog treats for sale. 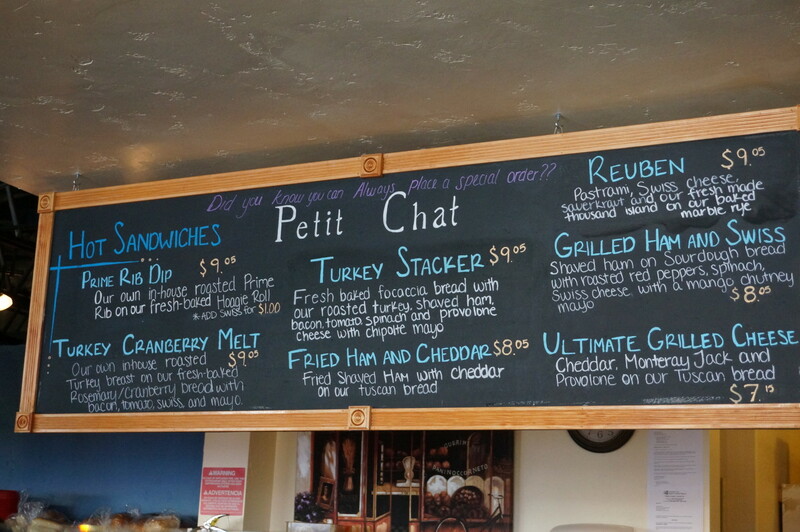 Located behind a gas station on the North Side of Spokane, close to the beautiful Holmberg Park, Petit Chat takes up an entire strip mall. 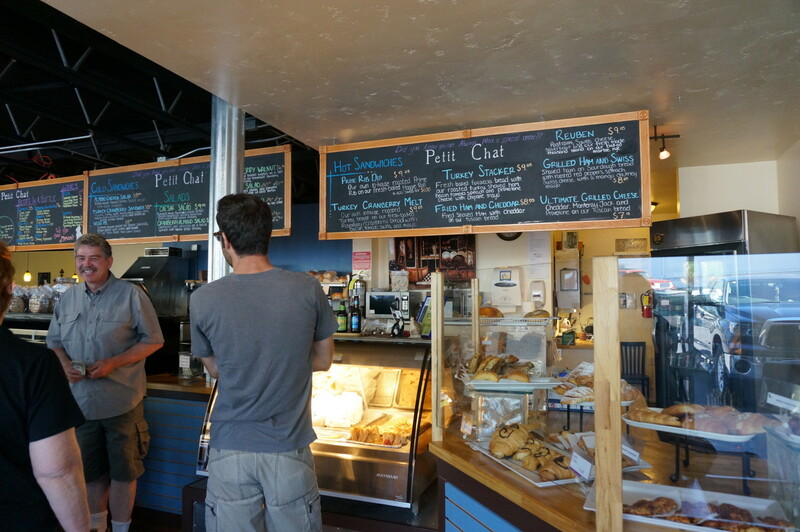 It isn’t until you step through the doors that you are transported to a French Patisserie. 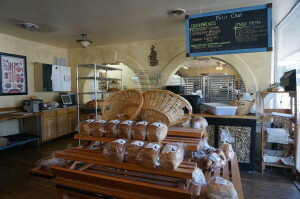 The bakery is filled with patrons anxious for a fresh pastry the size of a child’s head. The line begins alongside the pastry display where I had to decide between croissants drizzled with chocolate, piles of fluffy cinnamon buns and fresh bagels topped with melted cheese. When it was my turn to order, I chose a cheese danish along with a hot tea. The perfect snack to rev up my creativity. Also when I am out with my husband I never get anything with a cream cheese filling because we usually share and he hates cream cheese. So this was my chance to choose something just for me. 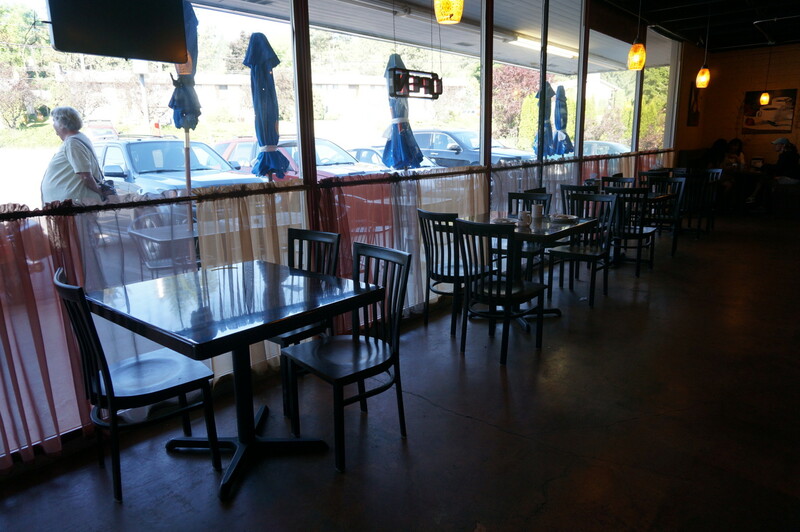 I chose a seat at a sturdy wooden table from among the many available tables (the dining area is quite large). While munching on my moist, flaky pastry and sipping my creamy earl grey I knocked out three assignments in a single hour. I have never been so productive, so it must have been that heavenly danish along with the soothing tones of the bakery. After I finished my work, I sat back with my tea and people watched (one of my favorite hobbies). Across from me was a group of older men drinking coffee and enjoying their morning get together. Beside me sat three women eating quiche quietly. Behind me was a young man talking about time that he spent in Nicaragua. Moms with strollers, young college students and retirees came and went, lending a neighborhood feeling to this place. 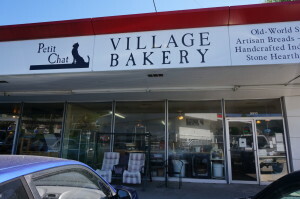 Now back to the bakery itself. 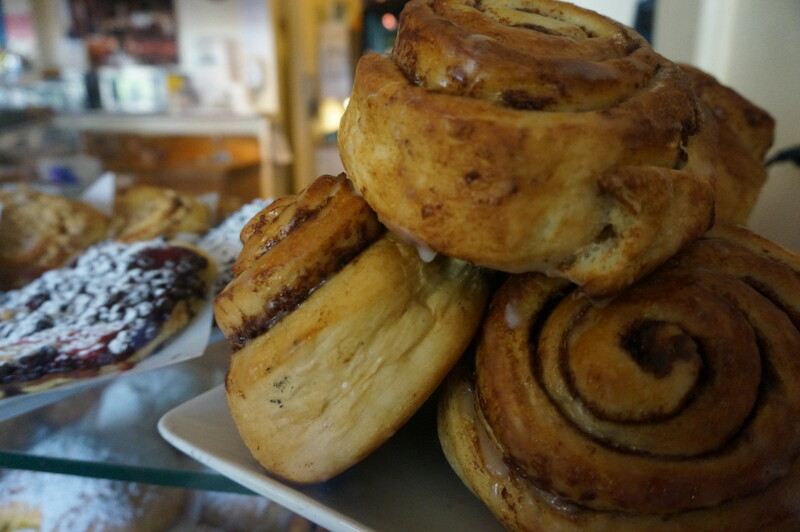 Often times when pastries sit out they also dry out, but not the pastries here. Somehow they manage to make extra large, very moist, fresh pastries. My guess is they don’t last long enough to dry out (judging by the never-ending lines). 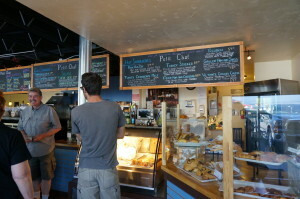 Another aspect I find heavenly is the coffee/tea bar. I like to make my own tea just the way I like it (1 sweetener and lots of half and half). 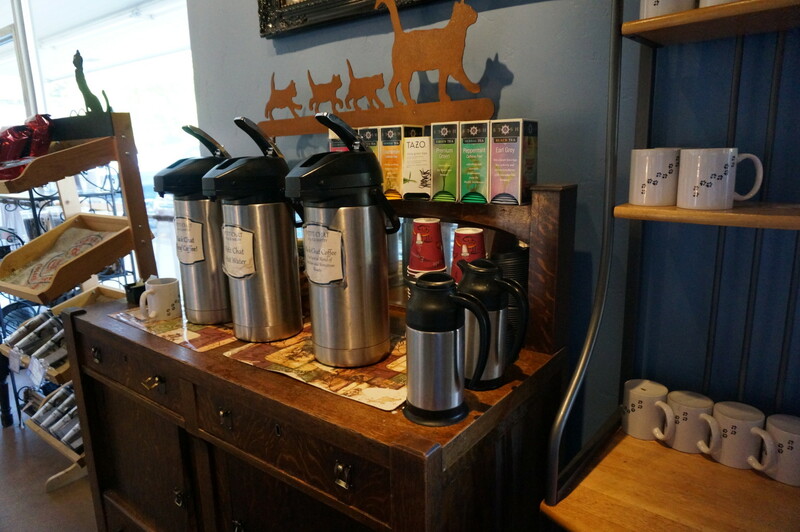 Petit Chat has a collection of mugs and a help yourself hot beverage bar where you can make your coffee or tea just to your liking. Along with pastries, Petit Chat also makes artisan breads such as Rosemary Cranberry, Cinnamon Chip Swirl, Sourdough three-cheese, Hearty Whole Wheat and Rosemary Ciabatta. Roasted garlic rosemary butter can be found in the cooler along with loaves of Banana bread and gluten free Chocolate Raspberry bread. Last week my husband and I picked up a loaf of Rosemary bread from the day old rack which we used for roast beef sandwiches. 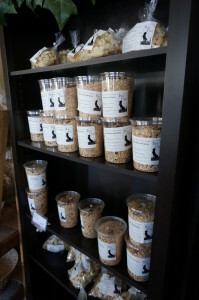 For those who love homemade granola, you can buy it here along with homemade bread crumbs and lavash crackers. Homemade cookies and pies in several varieties are also for sale. 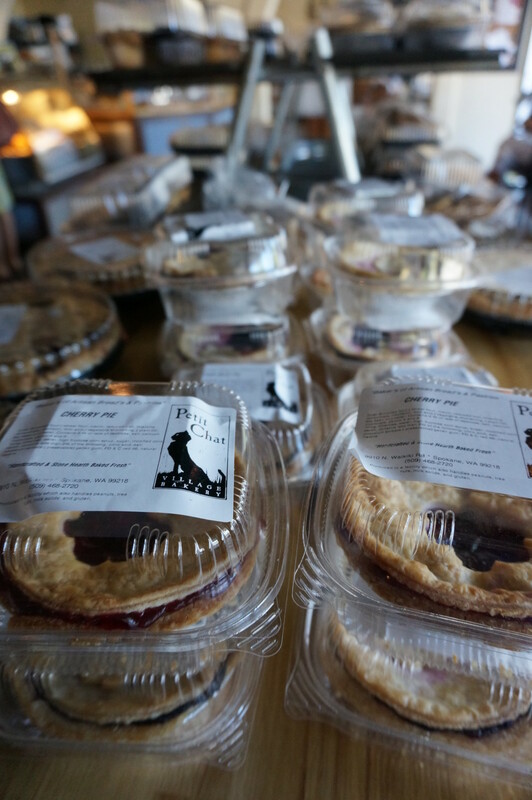 Fire roasted apple and cherry pie were both on sale while I was there, in both full and single serving sizes. I think single serving pies are genius. There are a lot of people out there who want some portion control. Not everyone wants to find themselves up at midnight with a fork and an empty pie tin if you know what I mean. For those looking for a meal, Petit Chat offers a variety of quiche, hot croissant sandwiches, signature sandwiches and salads. 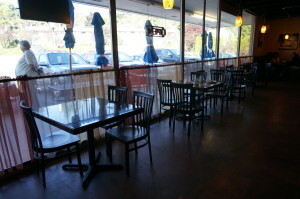 Bottles of beer, Italian sodas and iced tea are also available. 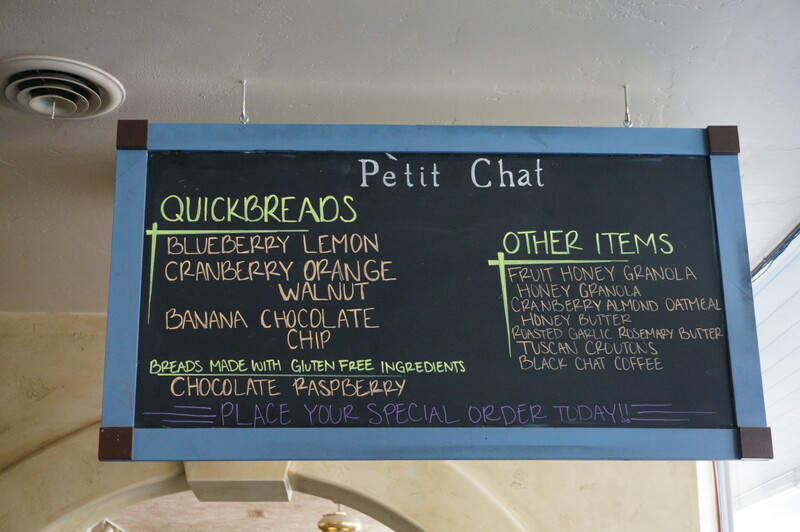 Spending the morning at Petit Chat transported me to a small french village bakery through their artisan products, superb service and warm decor. I now have a favorite place to write.